The arguments over the importance of Web standards are long past, but now it’s time to think about how Web standards should continue to be standardized. Jory, COO of Bocoup, summarizes a complicated topic. The creator of Dragula, a drag and drop component, shares some helpful tips for keeping your own modular front-end creations as clean as possible. Useful stuff for anyone building front-end libraries or components. Produces some striking effects. The homepage has numerous demos and a visual explanation of how it works. 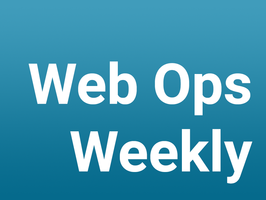 Now that it's a few months old and hitting its stride, it's a good time to check out our new 'webops' newsletter if you haven't already. It covers performance, deployment, monitoring, HTTP/2, and similar topics. A look at two approaches that the W3C’s Web Payments Interest Group is discussing for improving the user experience, speed and security of payments online. The WebKit project now has a page that shows the implementation status of numerous Web Platform technologies. Heydon Pickering explores how to use ARIA live regions which help us keep users informed of events in a way that is compatible with assistive technologies. Provides HTML5 runtime technology to the financial industry for high perform trading platforms. It’s possible to join for free (without getting any certification). From the context of using tools from Microsoft’s Azure Media Services. An inspection tool for Windows that displays accessibility API information (MSAA, IAccessible2, UI Automation, ARIA, HTML DOM) exposed by browsers to the operating system.